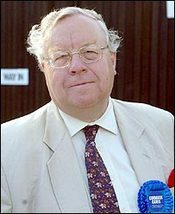 As the Daily Mail is reporting Sir Patrick Cormack MP failed to be readopted as Tory candidate for South Staffordshire at last night's meeting of the Association Executive. A ConservativeHome source says that Sir Patrick's speech to officers was disappointing. In arguing his case for readoption he emphasised his ambition to be Father of the House and his hope to have a stab at standing for Commons Speaker. The Chairman of the Association wrapped up the meeting quickly after the vote was announced. Sir Patrick has the option of seeking to overturn the Executive's decision by a ballot of all local members (the route successfully chosen by James Gray following his recent difficulties) or to be fastracked through to the final four person stage of a new selection process. ConservativeHome's source says that Sir Patrick did not take the vote well and refused to rule out standing as an independent conservative.